These rules foster good relations among walkers, bikers, adjacent landowners, and other trail users. They protect the trail system, people, and their right to use it. The rail-trail was designed and built for non-motorized multiple use, enabling us to enjoy the trail in different ways and skill levels. In addition, our motivations may vary widely from daily exercise, routine commute, recreating with friends and family, a walk with the dog, or a first time visit to explore a new trail. So as we seek harmony on a well-loved and used trail, please be aware of each other and follow a few simple rules for sharing. Share the Trail. Yield to slower traffic. Call out a warning when passing. Pass on the left. Stay to the right. Be safe- move off the trail when stopped. Cyclists and In-line Skaters wear helmets. Use lights and reflective clothing when needed. Stop at all road crossings and follow trail warning and advisory signs. 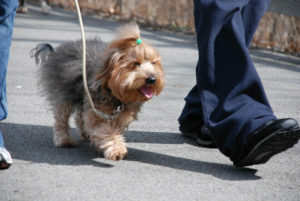 Keep pets on a leash and remove pet litter. Dogs should keep to the right with dog walker. Be aware of surroundings including being able to hear. If you wear ear buds or headphones, keep volume low or wear only one so that you can hear what is happening around you. Slow down in congested areas, especially near parks and playgrounds. Practice Leave No Trace ethic. Do not litter. Respect private property. Do not trespass by wandering off the trail. Only non-motorized forms of transportation are allowed with the exception of emergency and maintenance vehicles. Camping and Camp Fires are prohibited. No shooting firearms or hunting from the trail. Be sure to note the location on the trail and report unsafe conditions or maintenance problems to 304-292-0028 and trail violations to 911 or local law enforcement.